Reconstruction by Professor Stephen Upex. Mrs. Rachel Thurley, whose house in The Stiles today stands on the site of the Basilica, was used to her young son, Simon, and his friends digging up Roman objects in Godmanchester. Throughout the last century, children and adults all over town were acquainted with this excitement. 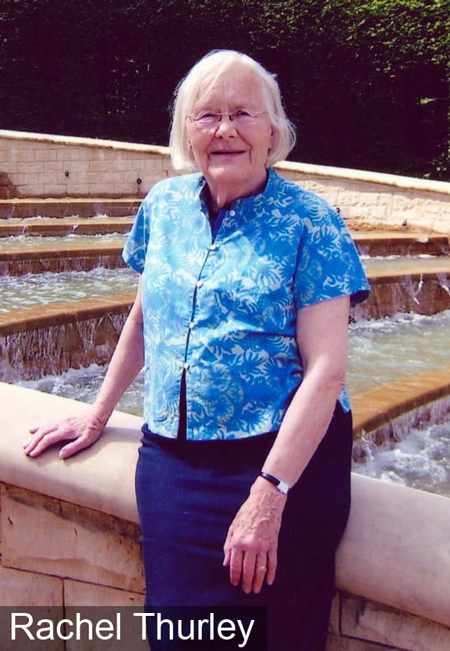 Indeed, her friend, the late Gerald Reeve, used to take naughty children with him to dig in order to steady their behaviour and to help them concentrate. At that time, in the 1970s, the family lived in Chapel House next door to her current home. One day a child who was staying came in from the garden and brought her part of a hunt cup appliquéd with the figure of a huntsman. The huntsman’s bow and his quarry, the deer’s antlers, were done in fine barbotine work. She took away the trowel. She says, “It was obviously a fine piece, better we waited until Michael Green came. We knew there was something there in our garden space. After all, we lived on the Roman road.” The family lived on Roman Ermine Street, the main arterial link between London and Hadrian’s Wall which still crosses Godmanchester. It is now a small road or pathway and known today as The Stiles. In his newly published book, Durovigutum, the late Michael Green’s entry for the discovery of the Basilica is dated 1971. He had seen the pillar fragment in Mrs. Thurley’s house and then found a third century major town building. It was massively constructed of Barnack ragstone and flint masonry with a pillared portico. It is suggested by Oxford Archaeology East that the capitol pillars in the Porch Museum, lent by them and found at Rectory Farm, were originally robbed from the Basilica in the late 4th century. 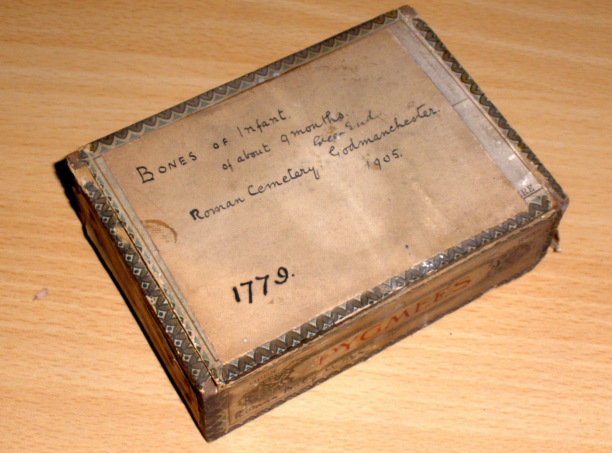 “Bones of an infant at about nine months, Roman cemetery, Godmanchester 1905”. The words were written in copperplate lettering on the slightly battered cigar box. It lay in an archive box amongst the remains of Roman pottery sherds. (i) Norris Museum volunteer Rodney Scarle was meticulously photographing and recording the large collection of Roman artefacts held at the Museum. He pointed out the box to me whilst we were chatting about his work. I asked whether I, as a biologist, could lay them out for photography. I opened the box, and there, protected by cotton wool, were the small bones and fragments. I gently began laying them out on a piece of card. The task was complicated by the fact that the bones of infants and very young children do not look like those of adults. (ii) Our adult hip joints for example, are made up of several bones that fuse together. Read more: Roman infant death in Godmanchester. 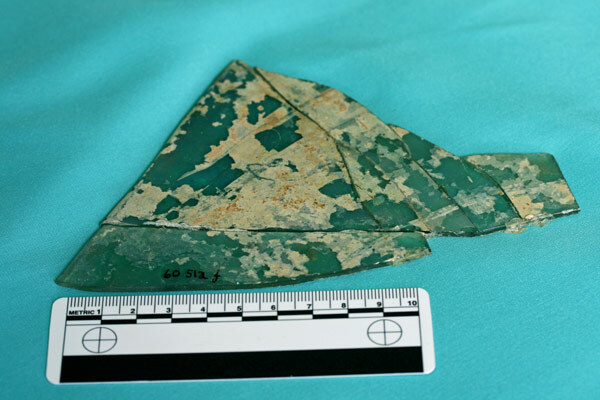 This glass window pane was found in the bath house excavations by Michael Green, Roman Glass 1959 and is one of many pieces of window glass found all over Godmanchester. The bath house which is on Pinfold Lane dates from the early second century and excavations show that it was constructed to a sophisticated level of service for the local inhabitants and indeed for the many travellers passing through the town. It's worth remembering that a Roman bath house was more than a place to bathe in, but somewhere to socialise. You would expect there to be local traders selling food within its walls, certainly trays of bead rolls and cakes or biscuits sweetened with honey and perhaps even savouries - Roman soldiers were particularly fond of sausages and meat pies as indeed were the rest of the population. Very likely scented oils were also commercially available to bathers using the natural perfumes from plants grown locally such as lavender, roses and rosemary and some expensive perfumes imported and brought by mule train up Ermine Street, the main trading route between London and Hadrian's Wall.